London, UK -- I am a Dutch student of Kundeling Rimpoche, one of the Dalai Lama’s major critics in the Gelugpa tradition. I’ll try to give an explanation of the Dorje Shugden controversy that is both understandable for those who are not initiated in the Mahayana-Vajrayana Buddhist tradition and still explains the very crux of the problem. When I met Kundeling Rimpoche in 1995 I was interested in Buddhism and thought he might teach me more then the zen-meditation class I kept falling asleep in. I was apprehensive with the idea of following a guru. However I attended some of his lectures and was especially impressed by the search for purity his form of Buddhism stands for, this together with the examining attitude towards the functioning of thoughts gave me the enthusiasm to meet up with him in 1996 again. ‘Tame your mind’, and ‘mind is always stronger then matter’ are two things that were very appealing to me then. Buddhism is not about faith but about examining your present circumstance. Being in a fragile body that can break down at any moment, how do you make your life meaningful? You shape your own destiny and if you want to grow towards enlightenment like the Buddha himself did, you can make progress towards that goal. This was the first time I heard a Protector Deity existed, a sort of helper on this path to enlightenment. In fact it is nothing more then a powerful thought, helpful in keeping the mind focussed on the goal which is the enlightenment one chooses to pursue. A protector helps to create the right circumstances to study Buddhist dharma, and is said to give his life to protect the serious Buddhist practitioner that relies on him. However as I said before it was just a thought. However as thoughts seem to be more important then matter, it really does make a difference if one has the backup of a fierce thought! 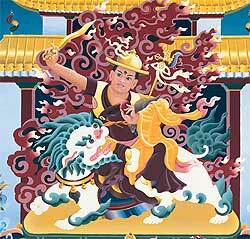 Then I heard that the name of my teacher's protector deity was Dorje Shugden and that the Dalai Lama had banned this specific deity from the pantheon of protector deities that exist. The Dalai’s explanation was that this specific deity caused hindrances in solving the Tibetan diaspora and was bad for his health. Supposedly people who relied on this deity were just after money instead of Buddhism, so the deity seemed to be out of order. My understanding at the time was such that I had no shame to ask Kundeling why he did not just choose another deity to protect him. In the end this deity-reliance is just a powerful thought, its just about faith and if you put your faith in another deity why wouldn't this work just as good or maybe even better then Dorje Shugden, surely the Dalai Lama will know won’t he?